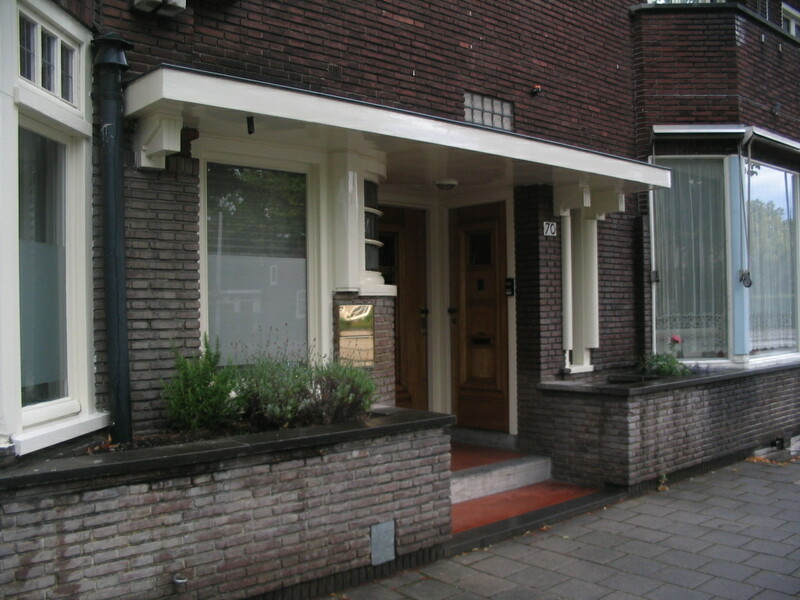 At the end of the afternoon, after the scheduled activities were over, I struck out on my own to visit the part of Amsterdam-Zuid (Amsterdam South) laid out by Berlage in the plan known as Plan Zuid, with the buildings themselves designed by Amsterdam School architects such as De Klerk. 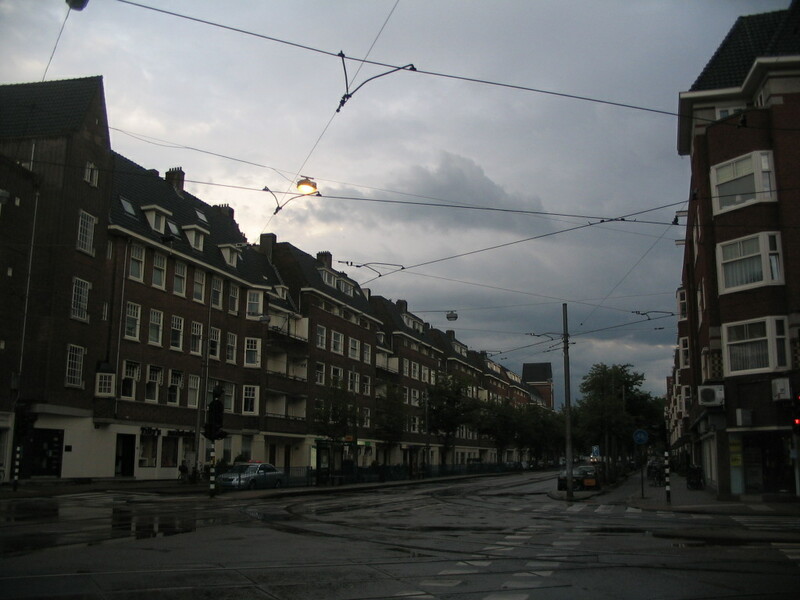 I had written a paper on Plan Zuid the previous year, so I was bent on visiting the area myself once we got to Amsterdam. 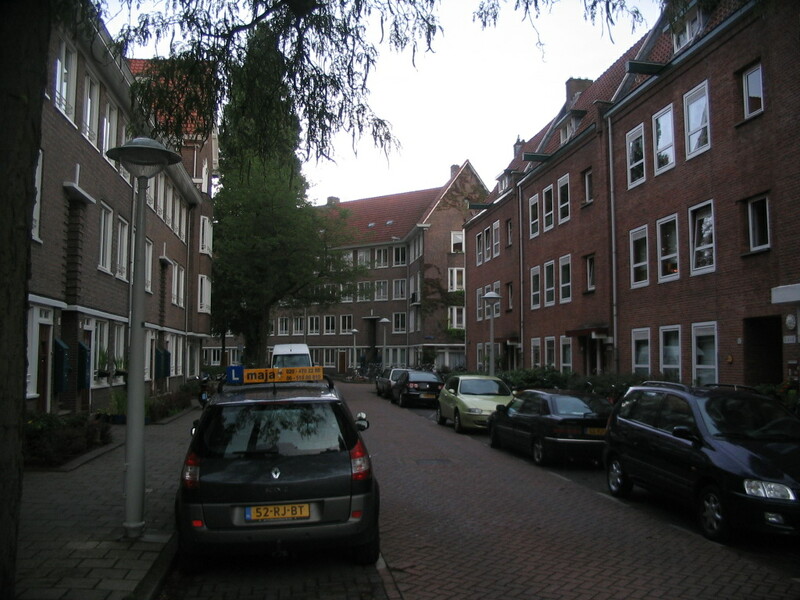 The present-day neighborhoods in the Plan Zuid area are Stadionbuurt, Apollobuurt, Prinses Irenebuurt, Rivierenbuurt, and part of de Nieuwe Pijp. 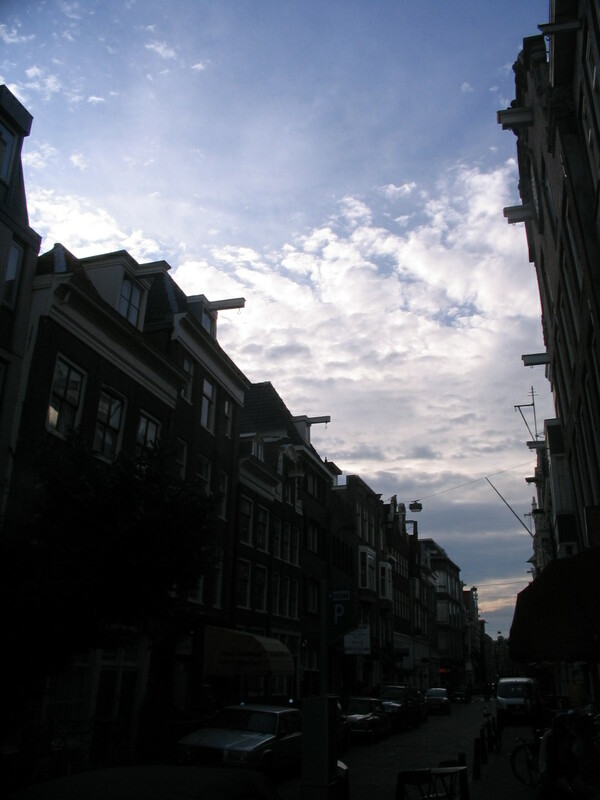 Clearing* skies over Kerkstraat near the hostel. 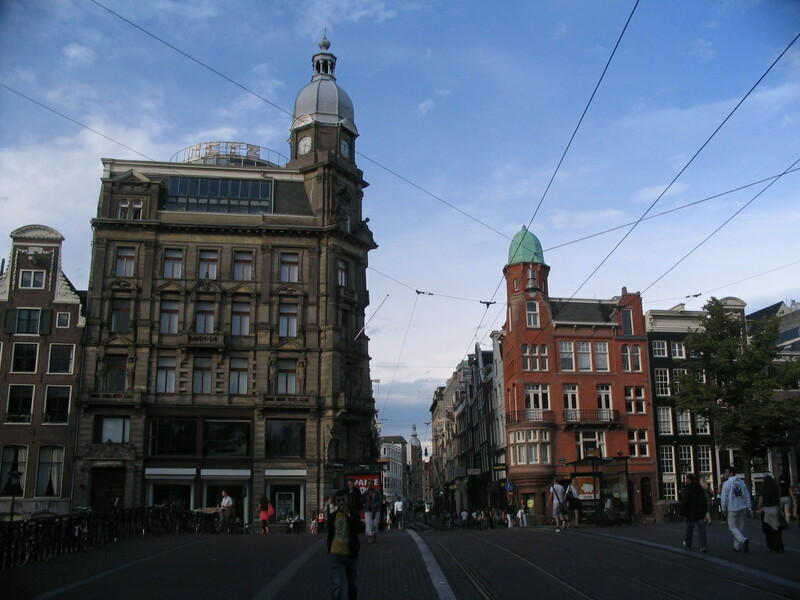 Back at Leidsestraat over the Keizersgracht in the cool afternoon light, to catch a tram to Zuid. 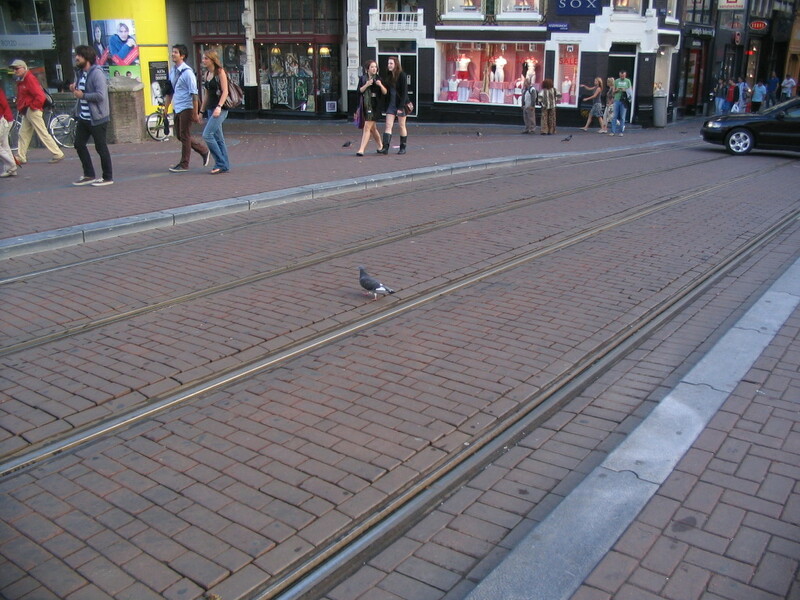 The tram passed right by the Van Gogh Museum. 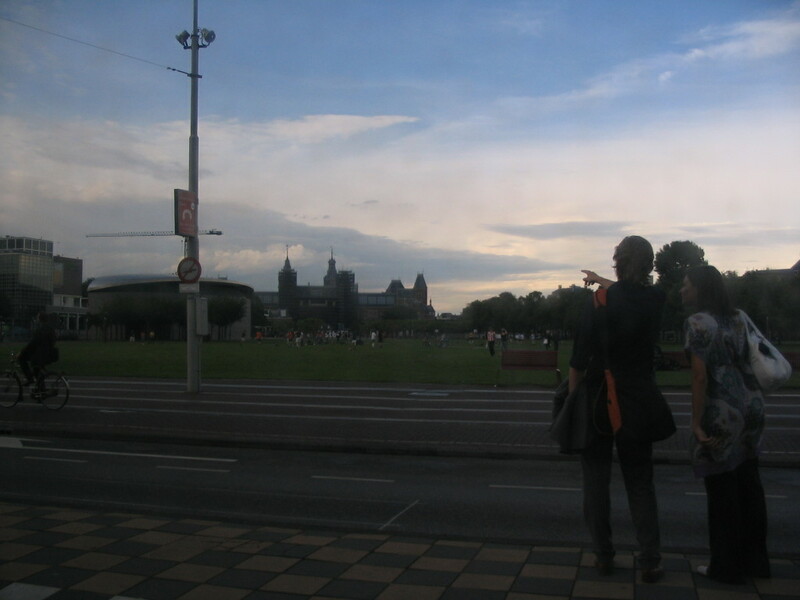 Everyone looking across the Museumplein all trying to figure out what's what. 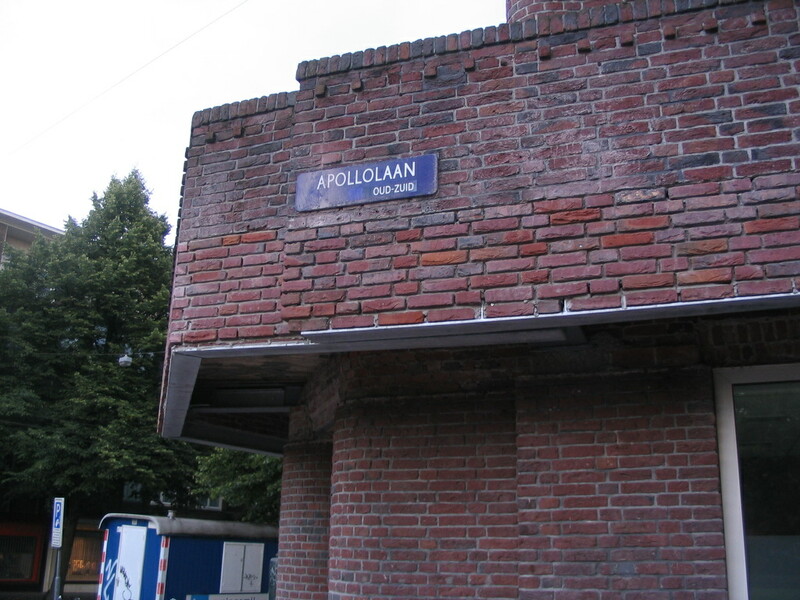 We arrived in Apollobuurt. 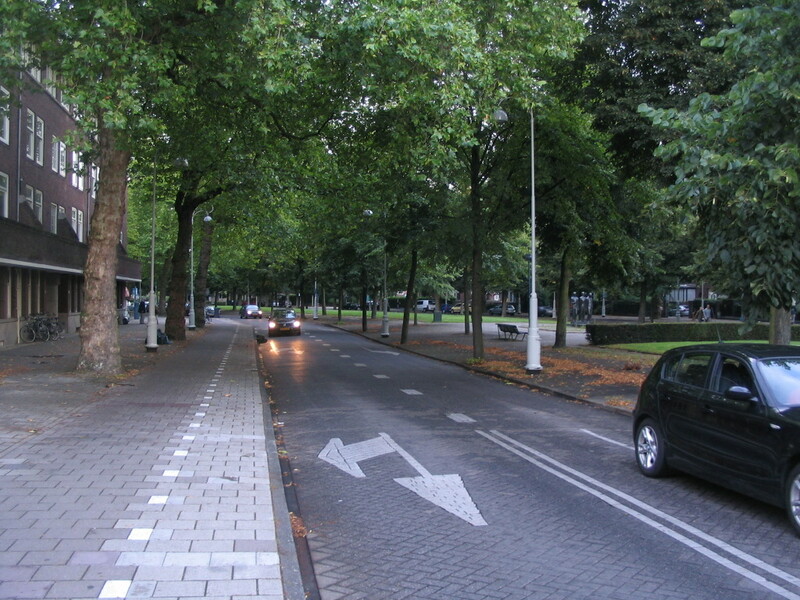 This is looking west on the Apollolaan boulevard at Beethovenstraat. 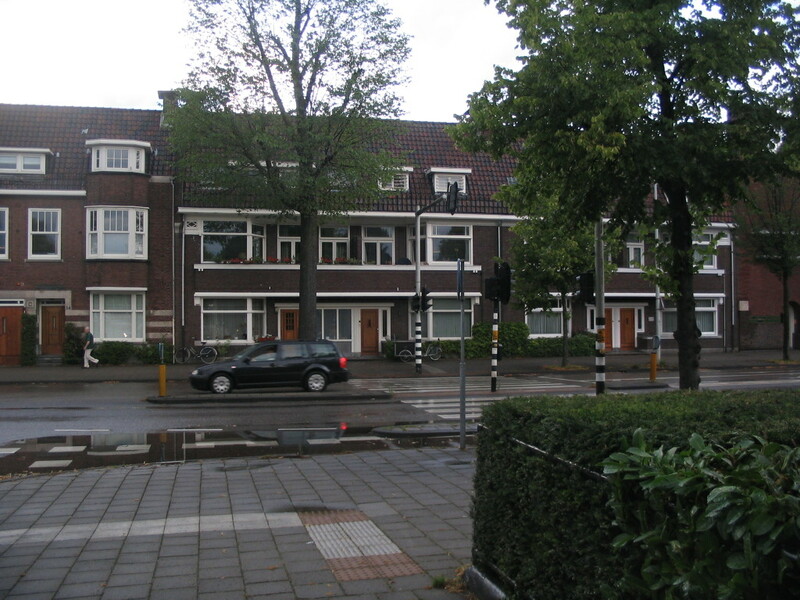 Many of the Plan Zuid streets have names from Greek mythology, tied to the 1928 Olympic Stadium in the neighborhood. Another massive balcony similar to those of Het Schip. 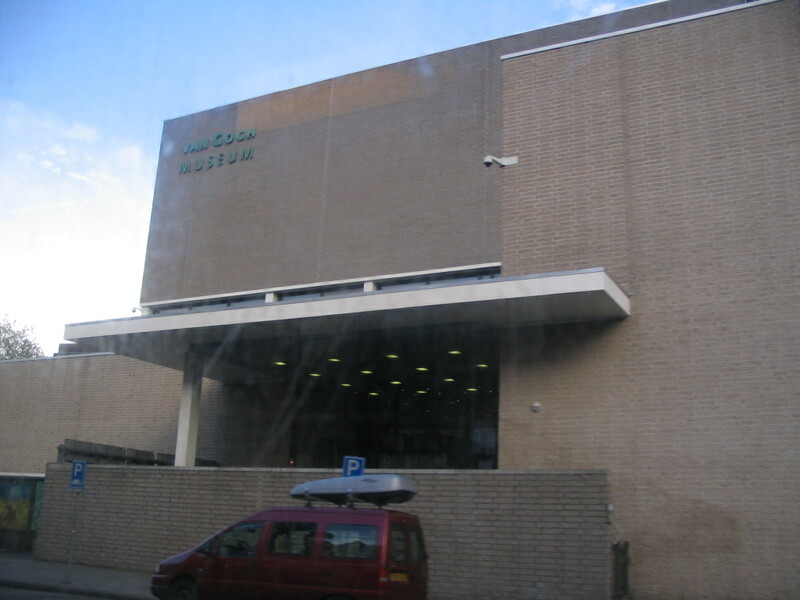 This sign is outdated as of this writing because the borough Oud-Zuid was subsumed into Amsterdam-Zuid in a 2010 restructuring. 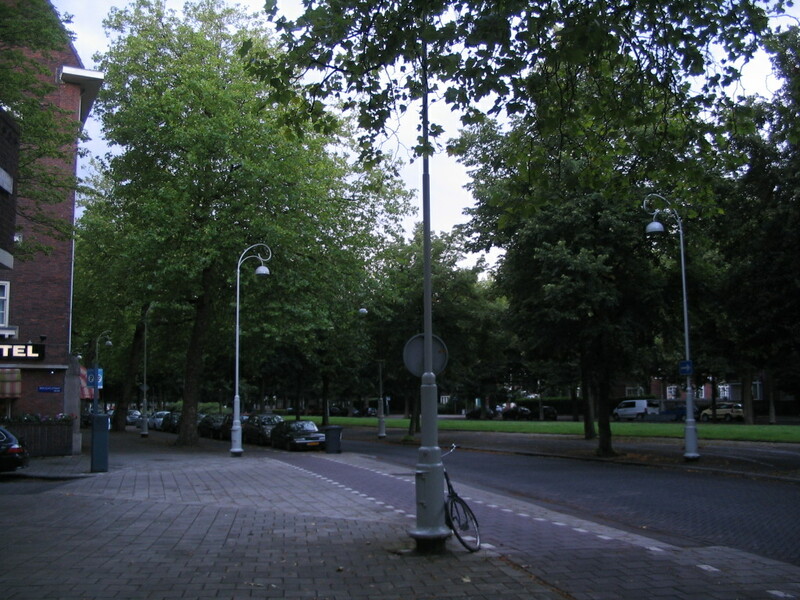 Further along Apollolaan. Hey where'd the sun go? 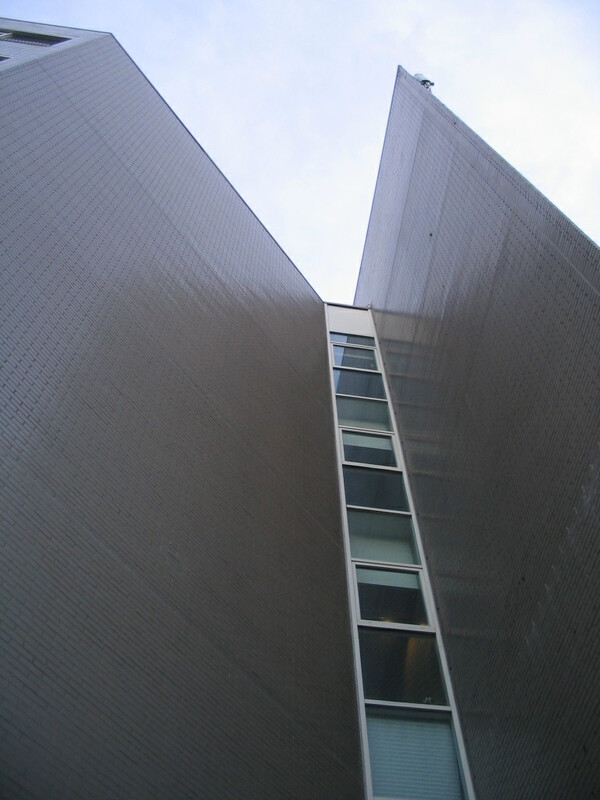 The deeply scoured edge of the ABN AMRO bank building at Apollolaan and Michelangelostraat. At the north end of the vast Olympiaplein is a monument with a long series of parabolic or catenary arches. 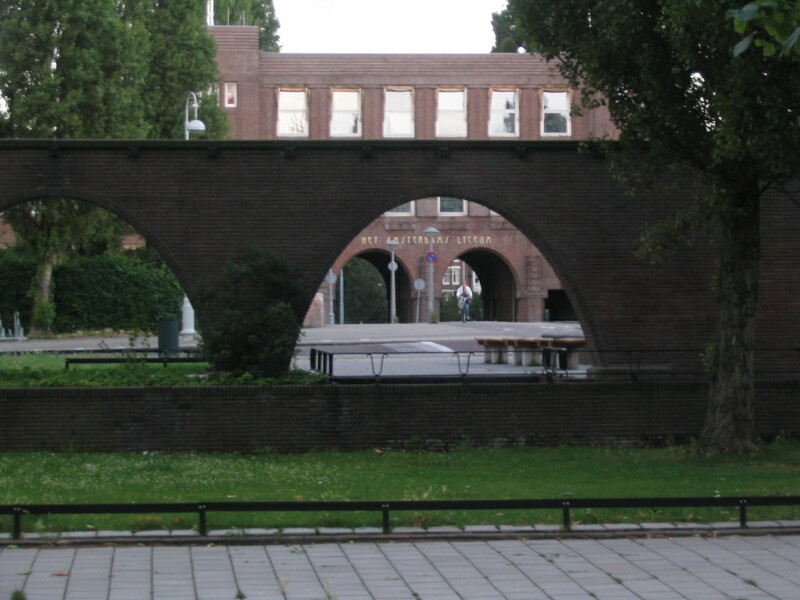 Here, more arches through those arches, of the Amsterdams Lyceum just north of the Plan Zuid area, across the Noorderamstelkanaal. 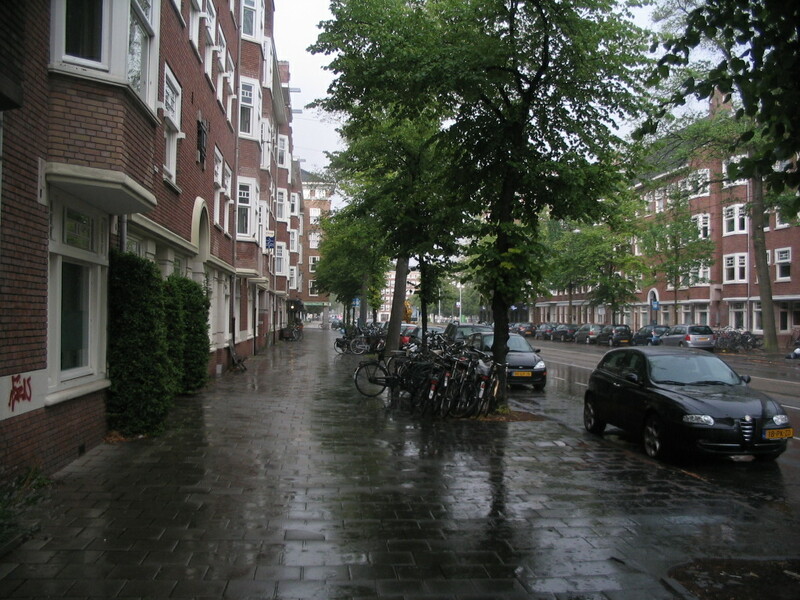 A typical side-street view down Speerstraat from Olympiaweg. 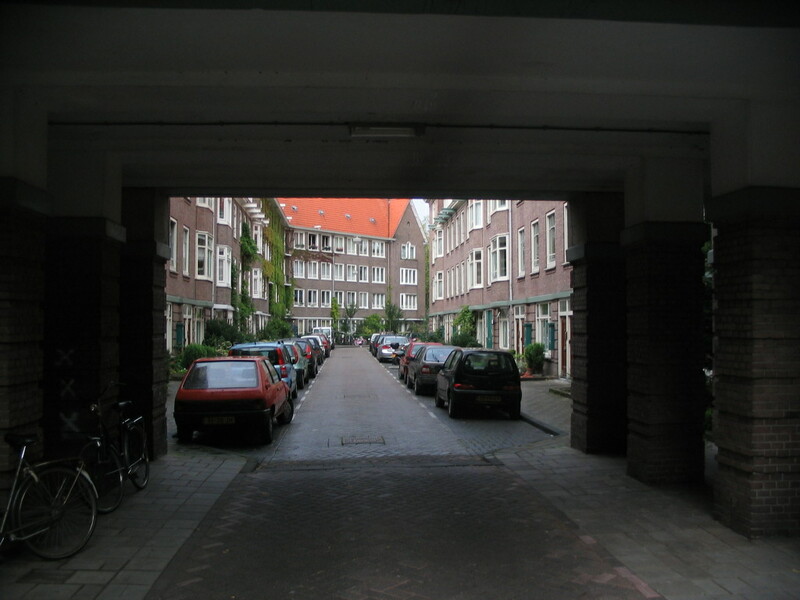 Often the blocks bridge over the side streets leading to their interiors, as here at Achillesstraat off Marathonweg, lending an intimate feel to the street space. 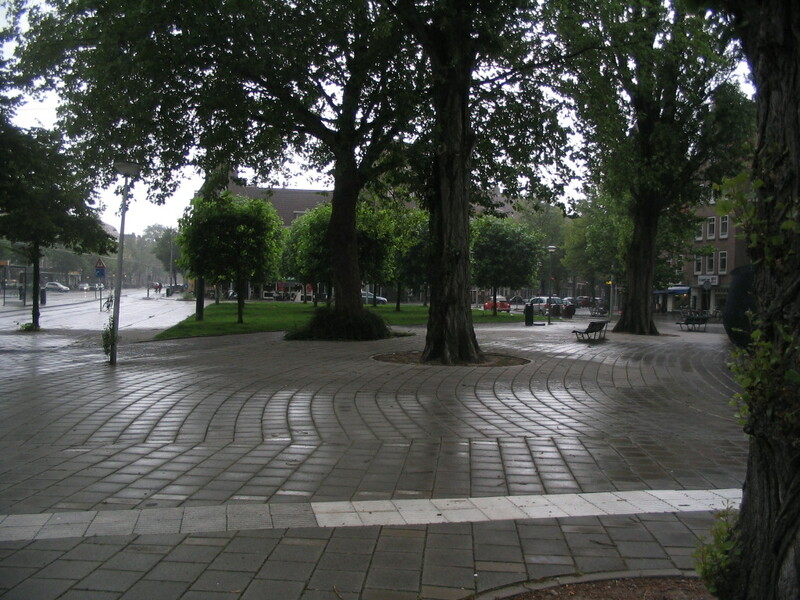 A nice little park at the end of Marathonweg on Stadionweg. Hmm, looking damp. *Clearly the clearing was only temporary. 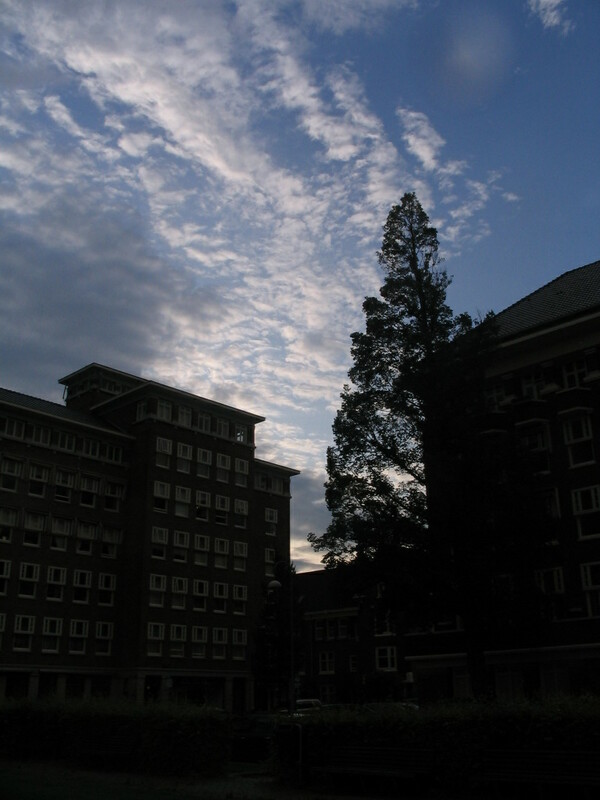 The rain came back in earnest. This is way at the south end of the Olympiaplein. Note the gigantic "4" in red on the ground. Aerial imagery shows it to be part of a gigantic "14". 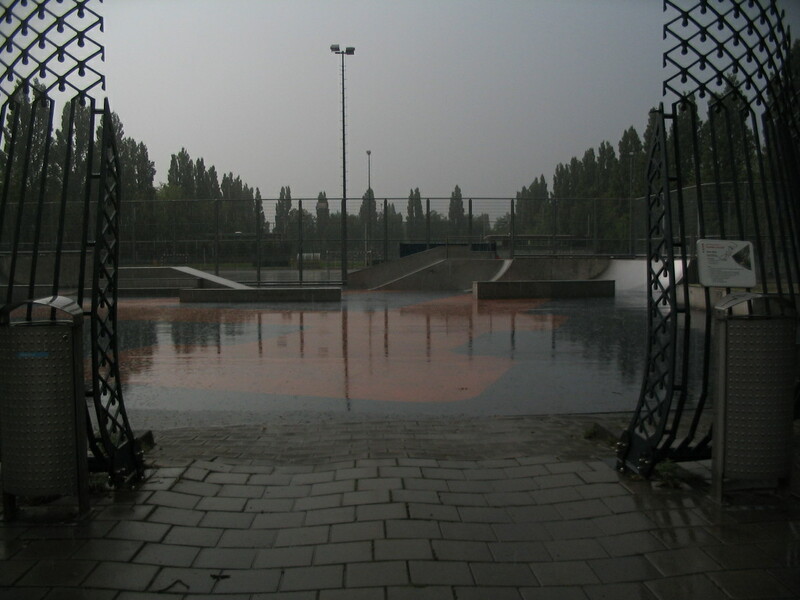 East from there on Stadionweg, looking pretttty soggy. 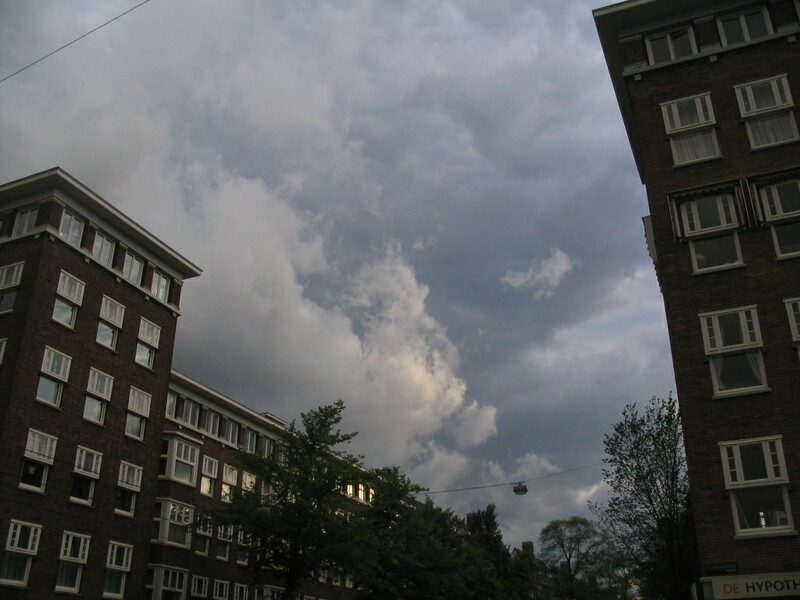 Dramatically-hued scud over Stadionweg looking west from the Minervaplein. 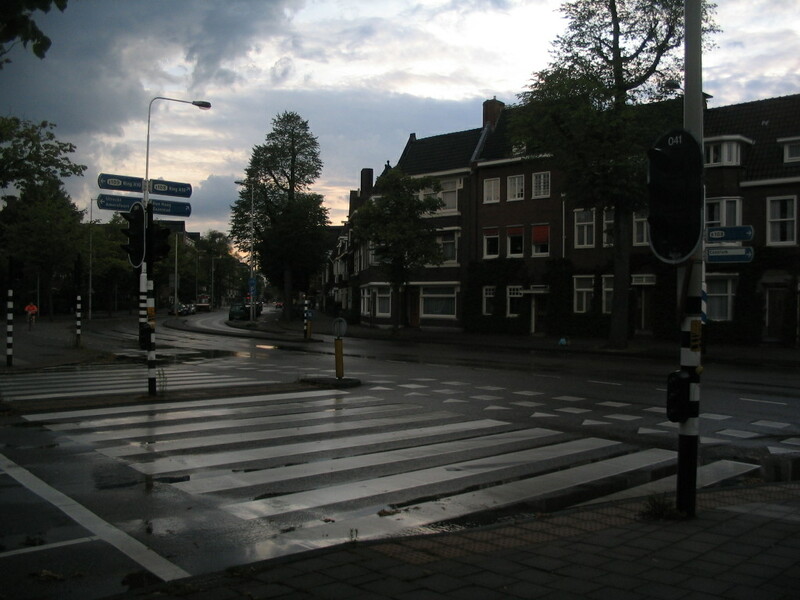 Looking south on Beethovenstraat from Stadionweg, the white trim of the windows rendered tawny by the evening light. 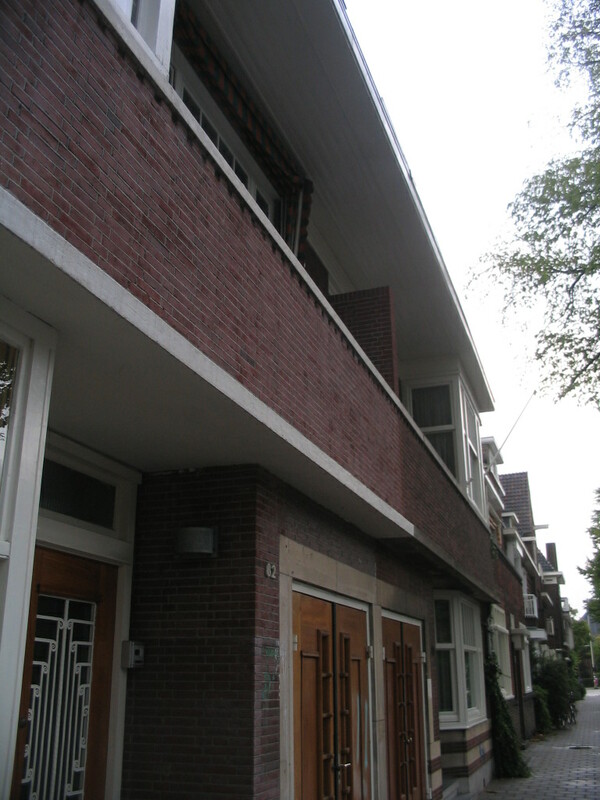 Yet another pleasingly chunky balcony further along the Stadionweg on the north side, just east of Schubertstraat. And a rather exquisitely detailed and nicely asymmetrical entrance a few doors further down. Look at that tiny window above the canopy! 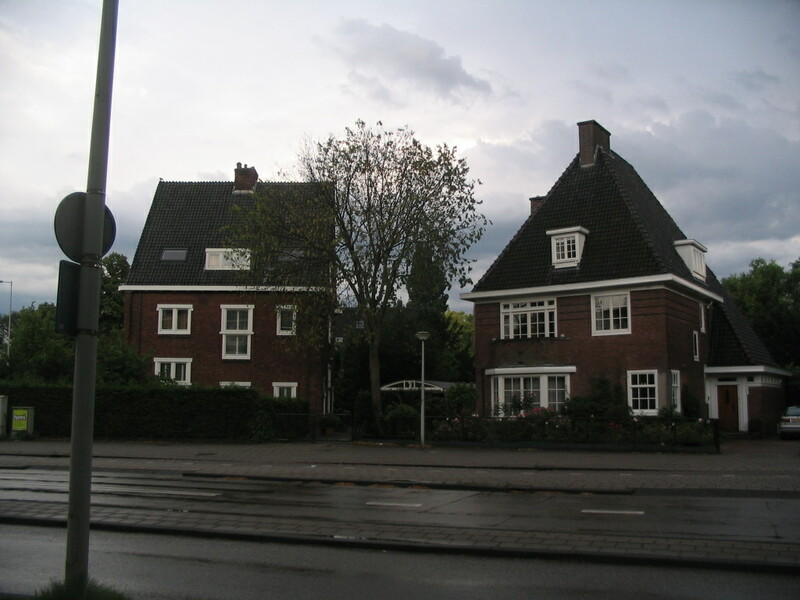 On the south side of Stadionweg are these detached or semidetached houses, which seem quite out of place in close proximity to the solid blocks across the way. Almost a glimpse of sunset at the corner of Stadionweg and Diepenbrockstraat. After this photo from the same viewpoint, my camera was too waterlogged from the rain to work anymore, and I was terribly worried that it might be permanently broken. However, I suppressed the panic and continued on the walk. I stopped at the Victorieplein, the major node in Rivierenbuurt, to sketch the Twaalfverdiepingenhuis and the statue of Berlage in front of it.